General Soft Drinks (GSD) have launched a new online app together with the help of Abakus Labs. 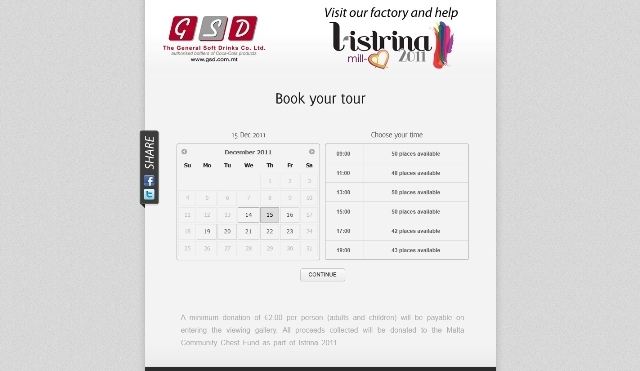 As part of their Social Corporate Responsability, GSD are organising tours of their factory in Marsa in aid the L-Istrina cause. Through this app, the general poublic can book a date and time slot when they can visit the factory. A minimum donation of €2.00 per person will be payable upon entering the viewing gallery. All proceedings gathered through these visits will be donated in aid of L-Istrina 2011.